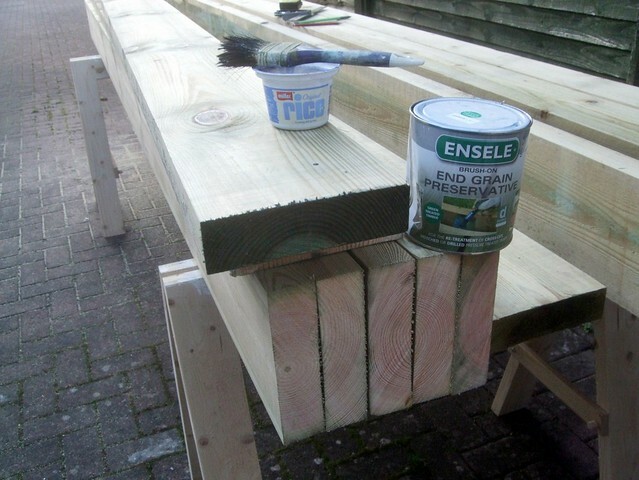 You see, the chemicals used in the pressurized tanalising process only penetrate the timber to a maximum depth of approximately 6mm (¼in) deep. Each time you make a cut, sand, rout or plane the surface, you are effectively ‘breaking‘ that seal. Any exposed timber should always be retreated by hand. 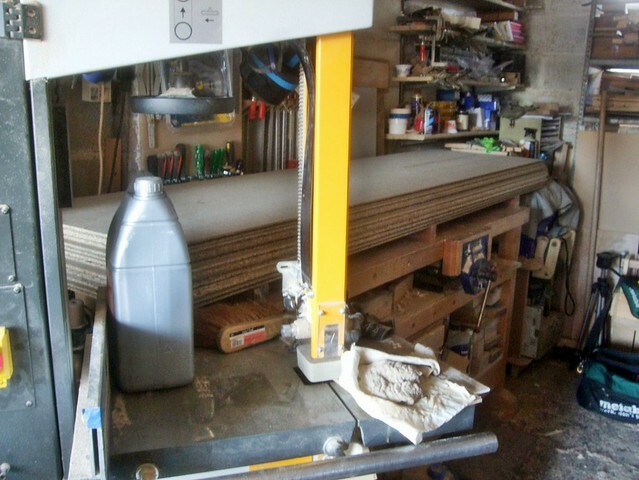 As this brush-on solution isn’t nearly as effective as flooding the wood with chemicals inside a large vacuum, it’s best that you don’t break the seal on anything that’s going to have direct contact with or, is going in to, the ground. This stuff is harmful, though, meaning you should always take the necessary precautions – wear rubber gloves and try to use in a well ventilated area, so as not to breathe in the fumes. 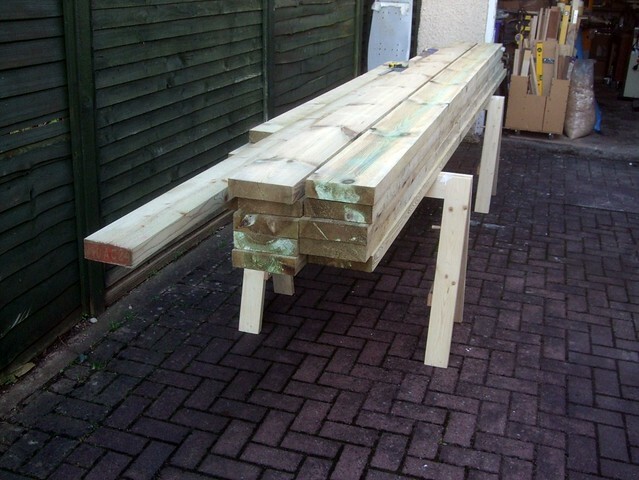 Similar risks are associated with the handling and working of treated timber, as the dust itself can cause all sorts of problems with your throat and nose. 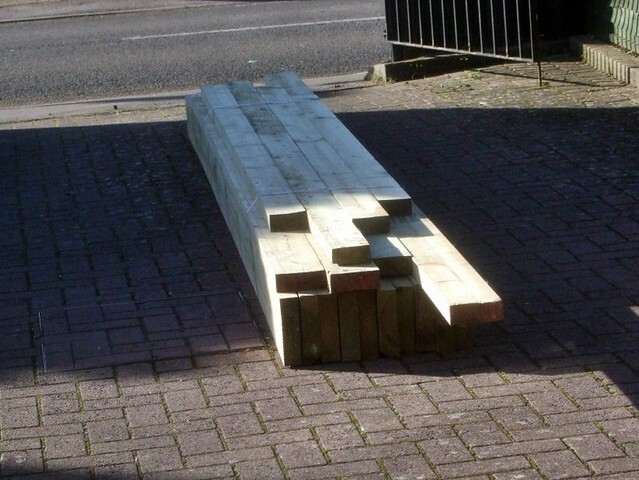 In order to get an accurate length for each of the joists, I fixed two scrap lengths of 2x2in timber together where they butted between the two walls – this is almost identical to a technique which was recently demonstrated by The Wood Whisperer [sorry, no photos of my own]. Except, I’m working on a much larger scale. 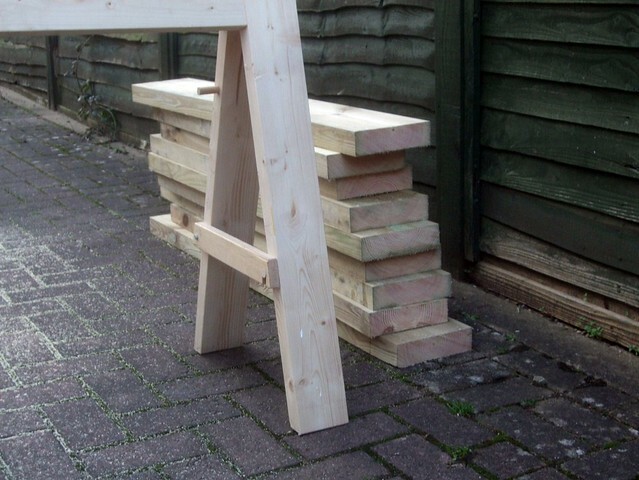 With floor joists, there’s a 6mm tolerance for the overall length of a joist, which can dropping the joists in to a hanger much easier, particularly where the walls in a building may not be straight, true, parallel or plumb! You don’t have to use up the whole 6mm allowance, of course. You may even find that cutting on the ‘wrong side‘ of a pencil line leaves you with all the clearance you need. 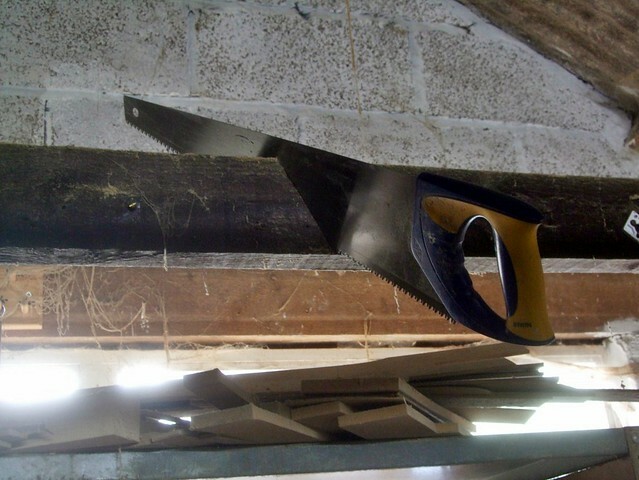 If ever you have to remove some old joists (and they’re not currently bearing load!! ), one tip I like is to saw through them at an angle (assuming you’re not hoping to preserve the wood), so that each of the fixed ends can then easily be levered away from the wall plates. As the timber didn’t arrive before 2pm, I wasn’t left with many daylight hours to work in, given that I had to strip down all the wires, cables and take down all the lights at the rear of the workshop before I could begin installing this floor. 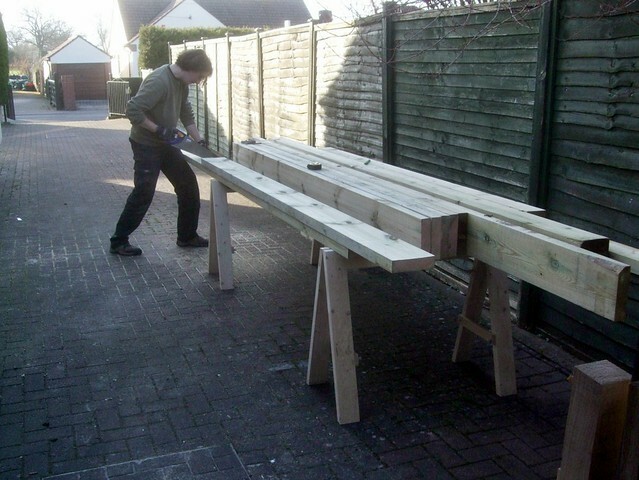 So, once I’d cut all the joists to length and re-treated the ends, I set about laying out the hangers for the joist spacings – and, in the next part, I’ll show you more on that! 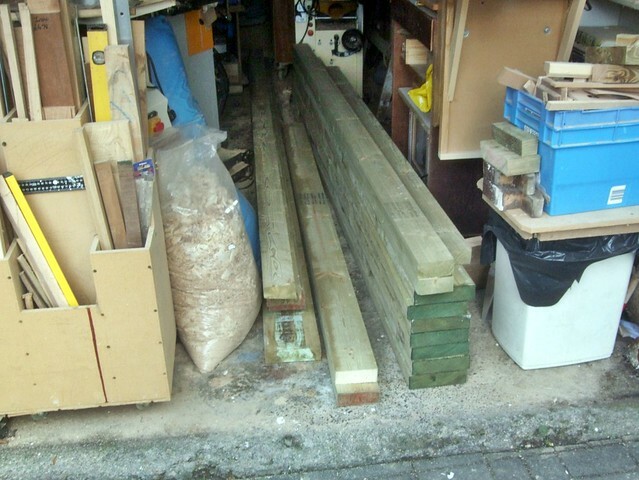 I’ll end this post by saying that, at the end of ‘Day 1’, if you can call it that, I was left with the predicament of how to store all these 3m and 3.6m lengths… Well, the image above won’t please everyone – and, this is without either of my sawhorses or the nine <3ft lengths of 7x2in I’d almost forgotten about, when I came to take this photo!! Needless to say, I wasn’t doing anything out here overnight. I couldn’t even get in without risking a broken ankle.